My special guest on the podcast today is Steve Huntley, the former editor of the editorial page at the Chicago Sun-Times. For a long time, Steve was one of the few conservative voices in Chicago newspapers. 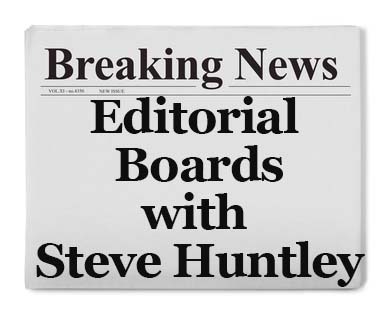 Today Steve is going to provide us with tips on editorial boards from his years of experience in the journalism world. If you are running for local office or considering a political campaign, then you will need to prepare for an editorial board. The tips you learn today can help make sure that you have the best experience possible and take full advantage of the opportunity. Learn all that you can now to take full advantage of your editorial board experience. Throughout a journalism career that has spanned fifty years, Steve Huntley has experience doing almost everything. After graduating from UNC Chapel Hill with a BA in Journalism in 1965, Steve began his career as a reporter, writer, and editor for the United Press International. Since that time, Steve’s distinguished career includes being an editor for the U.S. News World and Report and editorial page editor for the Chicago Sun-Times. Under Steve’s leadership, the Metro staff won Lisagor awards in 1996 for coverage of the Fox River Grove, Ill., school bus-train crash that killed seven children, in 1993 for coverage of the Chicago Loop flood and in 1992 for the “After the Shooting Stops” series on the impact of violent death on families and communities. After Steve became the editorial page editor, the Sun-Times editorial page staff was twice awarded the Peter Lisagor Award for exemplary journalism. Steve was a twice-a-week freelance OpEd columnist on public policy, politics, and national and international affairs at the Chicago Sun-Times from 2008 to 2015. He co-authored Knocking Down Barriers: My Fight for Black America, by Truman K. Gibson Jr. with Steve Huntley (Northwestern University Press). Steve now lives in Texas, with his wife, Linda. They have two daughters, Kristine and Katherine. This entry was posted in Podcasts and tagged editorial boards, local politics, running for local office. Bookmark the permalink.